You can watch the entire journey below. Shot using the GoPro. To access Primrose Cirque, you're going to drive up Provo Canyon heading to Sundance Ski Resort. You'll go past Sundance and head to the Aspen Grove trailhead. You'll see the majestic Mount Timpanogos in the distance. 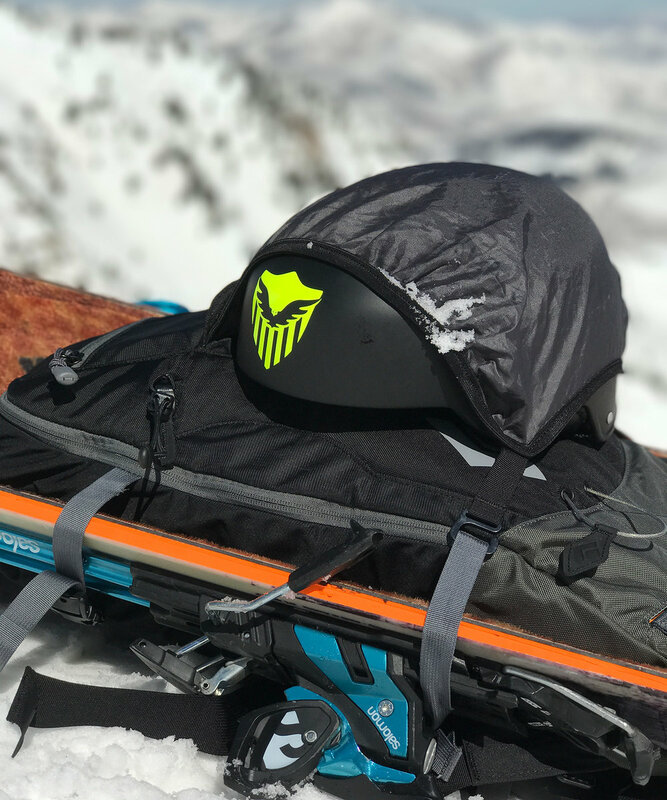 Get on your gear, do your avalanche beacon checks, and get ready for an awesome adventure with amazing views. The distance to the summit of the Primrose Cirque is about 2.3 miles with about 3,110 vertical feet of elevation gain. It's worth the work. Once you leave the Aspen Grove trailhead parking lot, you'll travel through a flat area of trees. As you leave the trees you see the majestic view of the Primrose Cirque with Roberts Horn peak in the distance. Just as you leave the flat area you'll come to a huge cliff. I have named this the Devin Stratton cliff. 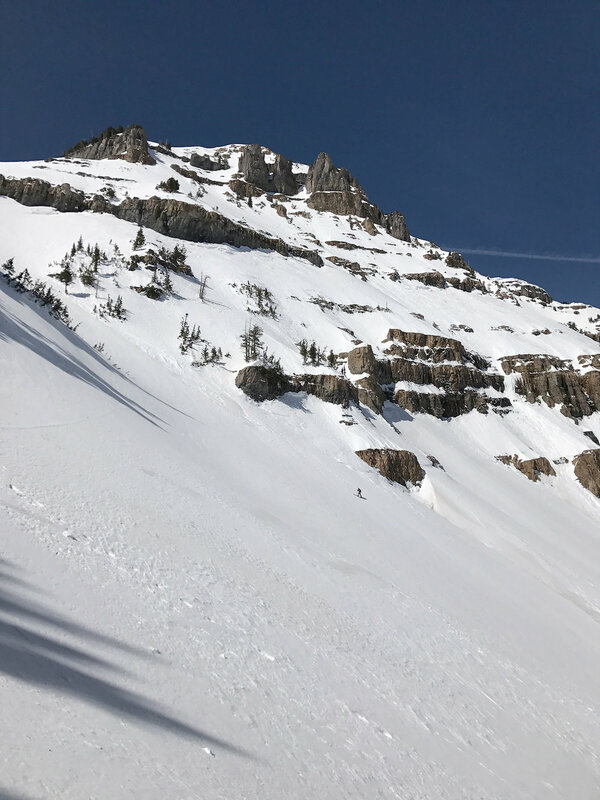 On January 24, 2017, Devin mistakenly skied of this cliff and lived. You can read the story and watch the video here. If he would have made that mistake on a day like ours, it would have been a much harder landing. Glad he was OK and that he skied away safe. 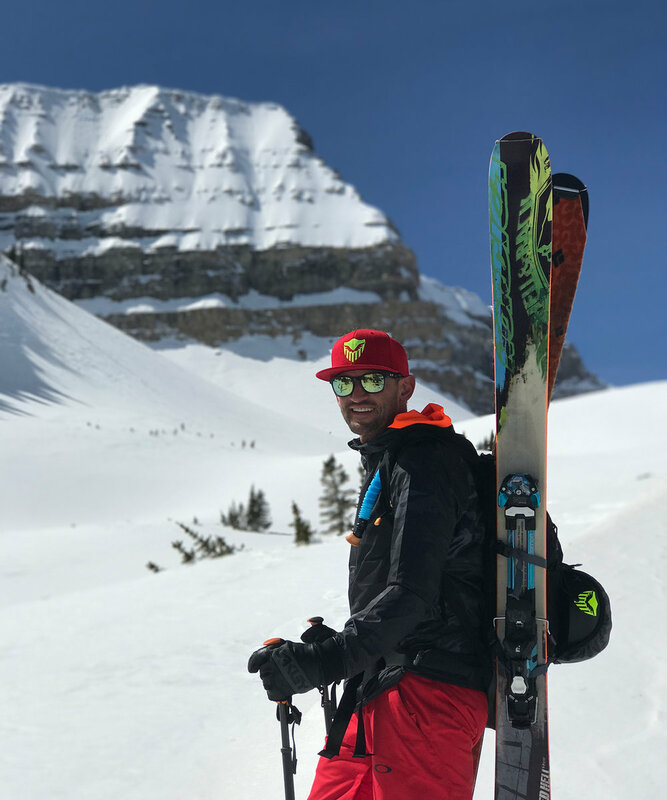 Passing around Devin Stratton's cliff, you spend time in the middle the majestic glacier-like snowfield with amazing mountains surrounding you. The views of the peaks and your surroundings become very motivating. 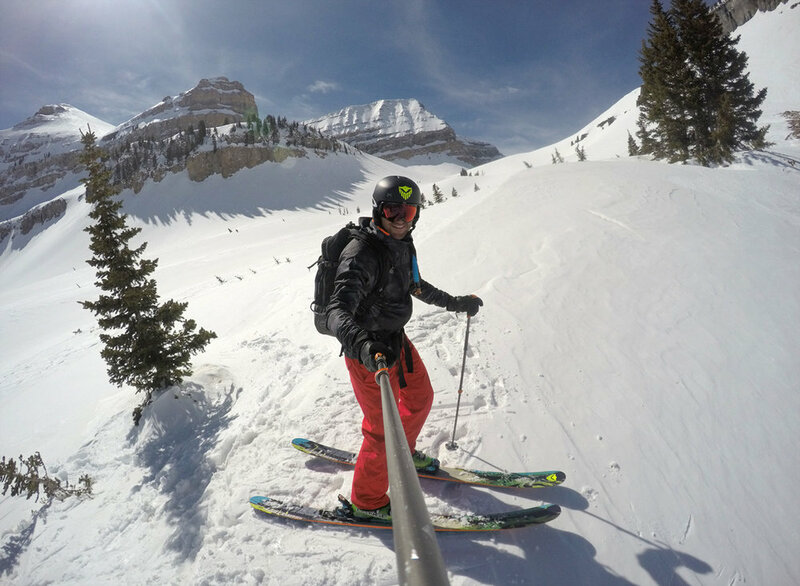 It is one the unique ski tours of the Wasatch. Once you get around the corner, you'll see the face of the mountain. We decided to make our approach to the left of Roberts Horn. On this day, we knew that the heat from the sun on the rocks would cause wet sluff avalanches. As we climbed, we witnessed three or four of them come down off of Roberts Horn. That is alway spooky to witness. Unless you're my good friend, Rob Sunderlage, you'll most likely transition to booting up the face of the mountain. The face pitch gets steep and can make it tricky to keep the skins on. I don't mind booting, it makes it feel like more of an adventure. Here is a picture I took of Rob skiing up the cirque. You can see just how big and steep the face is. This was amazing to watch. The snow was firm, so watching Rob skin it on ice was impressive. Rob and I meet up with just below the summit of the cirque with Roberts Horn to our right. The rest of our group was just behind us. The booting up to the top of the cirque was steep. The 360 views were incredible. Every direction provided an amazing witness of the greatness and inspiration of the mountains. Below is a good picture of the steepness. Like any good ski tour, you start to feel the excitement as you approach the summit. This was the case on this day. As I made my final steps, the backside of Mount Timpanogos emerged. The view of this mountain is big and inspiring. This is a picture of my friend Doug Anderson with Mount Timpanogos in the background. And Rob—one of the few that could have skinned the face. After taking in the amazing 360 views and fueling up with water and snacks, we put on our skis and enjoyed the down. Nothing like dropping in the cirque with Mount Timpanogos in the background. The ski descent had various snow conditions. Up top it was soft. The middle was a little firm (like a groomed run). The bottom was the soft corn that makes spring skiing amazing. Once we got off the steep cirque below Roberts Horn, the whole snowfield was an amazing playground with rolling hills to catch air off of. What a great day and an amazing spring tour. 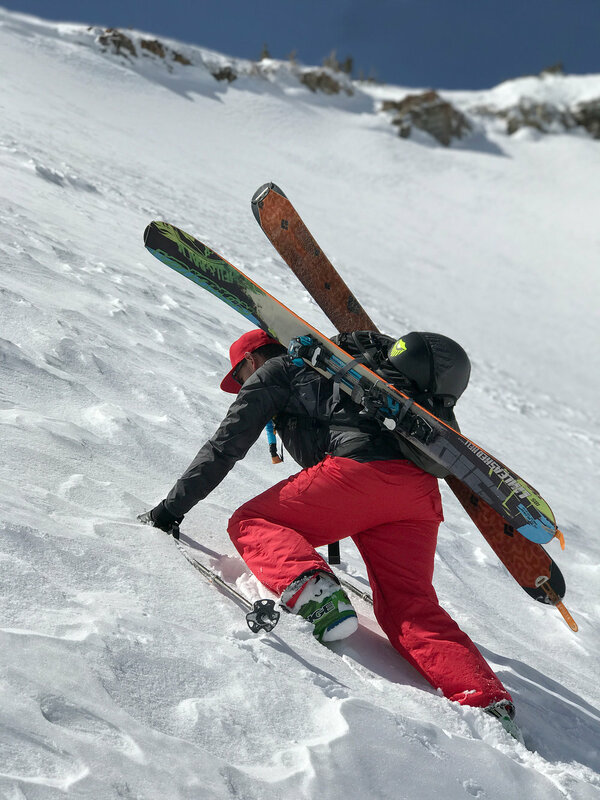 There is nothing better than the feeling of setting a goal to climb a mountain, pushing through the difficult times, arriving at the top, skiing down safe, and driving away with smiles. Thanks for joining me on this adventure. Make sure you get out and explore the outdoors where you live. It will give you energy, happiness, and fulfillment. Until next adventure. If you would like to see the video of our adventure you can view it on YouTube here. I also used the iPhone 7 Plus in portrait mode.